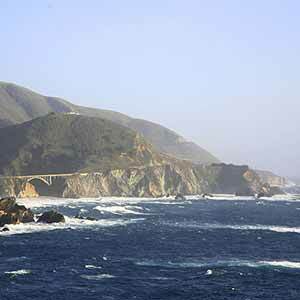 This immensely scenic loop hike runs along steep coastal bluffs with Mt. 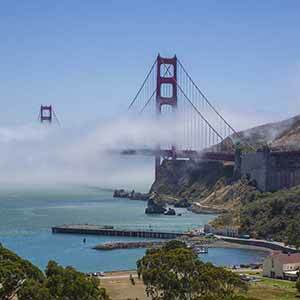 Tam’s best ocean views before dropping down to the seaside town of Stinson Beach. 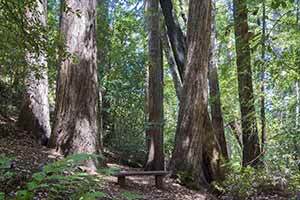 After a possible stop in town for refreshments and a break on the attractive beach, you’ll climb through the lush old-growth redwoods of Steep Ravine. Superb scenery and great variety make this Mt. Tam’s most enjoyable hike. 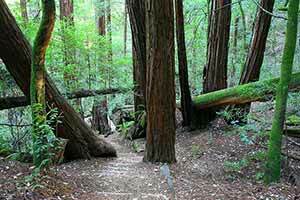 The hike described below starts at the Pantoll parking lot, putting the Stinson Beach break in the middle of the hike and the best scenery (the redwoods) near the end. However, Pantoll has become so popular that it’s difficult to park anywhere near there after 9 am on a summer weekend. On such days it’s better to start from Stinson Beach instead. 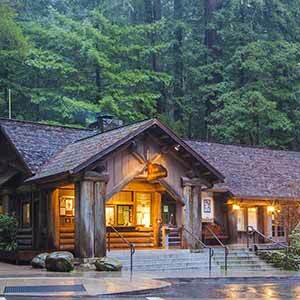 It’s only 10 minutes more driving to Stinson Beach and there’s always parking under the eucalyptus trees at the end of Avenida Farralone, at the Willow Camp Fire Road trailhead. Start at the Pantoll parking lot. 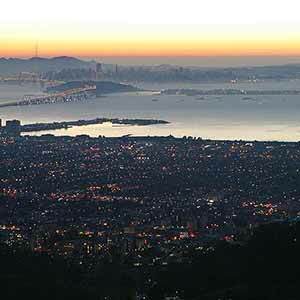 From Pantoll, the well-used Matt Davis Trail winds through somewhat dull laurel woods for a mile before emerging onto grassy hills with a superb view of the ocean and San Francisco. 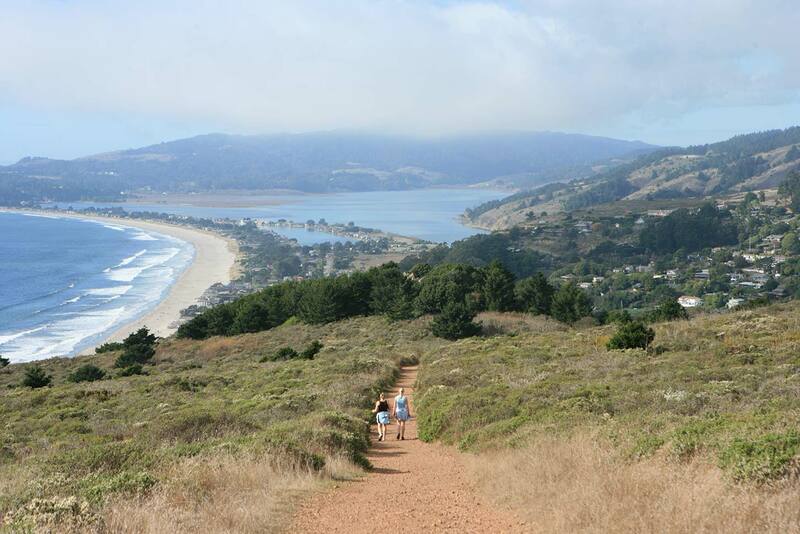 Turning a corner, you next get a magnificent view of Stinson Beach. The sound of the crashing surf far below can sometimes be clearly heard. 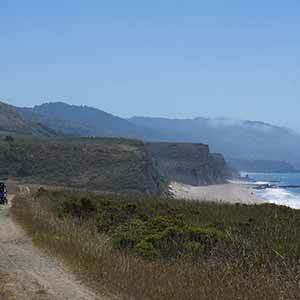 After a brief quarter-mile of these coastal views, the Matt Davis Trail reaches an intersection with the Coastal Trail. 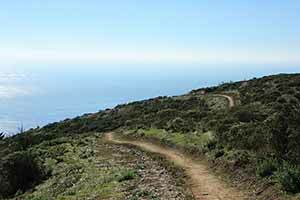 Almost everyone turns left here and continues down the Matt Davis Trail, which is one of the most popular trails on Mount Tamalpais; on a summer weekend you might see one or two groups each minute. 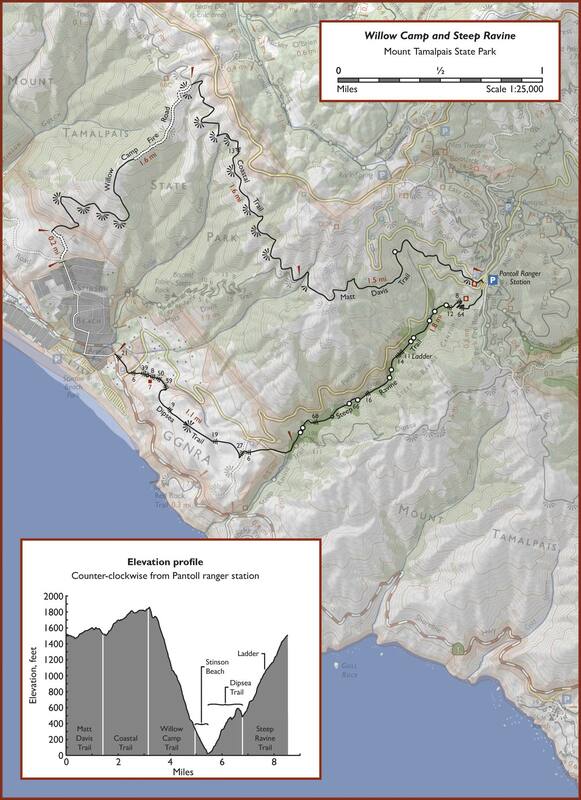 I think everyone goes this way because it’s the easiest route; it’s direct, it’s shady, not too steep, and it’s well maintained (although it does have a lot of poison oak). However, the scenery is really nothing special and there aren’t any views to speak of. It’s well worth an extra hour of hiking to skip the Matt Davis descent and instead continue straight ahead to the Willow Camp Trail. 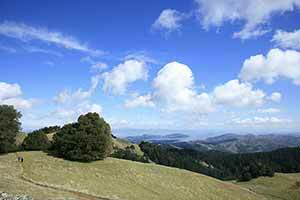 Admittedly the Willow Camp route is longer and the descent is uncomfortably steep, but it has the best scenery on all of Mount Tamalpais. In particular, the ocean views are absolutely stunning and are what make this entire hike worthwhile. It also makes a nice contrast with the wooded ascent up Steep Ravine. 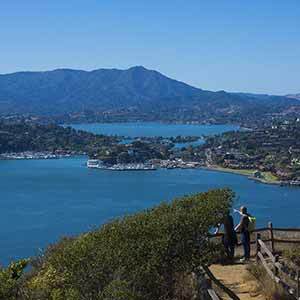 To take the Willow Camp route, continue north and generally uphill on the Coastal Trail, which is cut into dizzyingly steep, grass-covered bluffs. You may have to brush past tall grass overhanging the trail. As the trail continues north the views open up and become progressively better. The faint sounds of kids playing on the beach far below drift up. 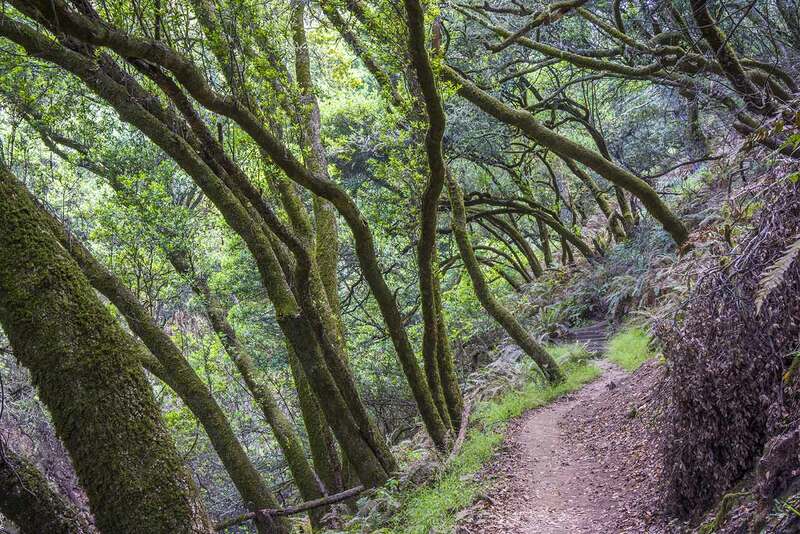 Turn left onto the little-used Willow Camp Fire Road, which climbs slightly to the top of a little knoll with one of the best views of the hike before beginning its unpleasantly steep descent. It can be slow and exhausting, but there’s little danger of falling off a cliff, and the trail is clearly visible. 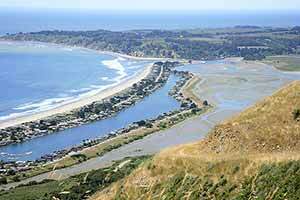 The bustling coastal resort town of Stinson Beach makes an enjoyable stop on the hike. The long, attractive beach is popular in the summer, although the water is too cold for swimming. 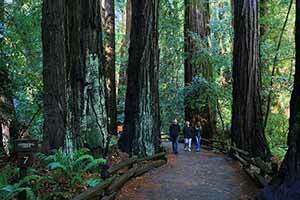 Steep redwood-covered bluffs rise up above the town, giving the beach a distinctly Northern California look. Several restaurants along Highway 1 and Arenal Avenue serve lunch and snacks, although the prize for the most scenic location goes to the Siren Canteen, which is right on the beach in the same building as the main lifeguard tower. 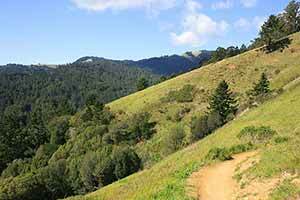 Pick up the Dipsea Trail just south of the business district. 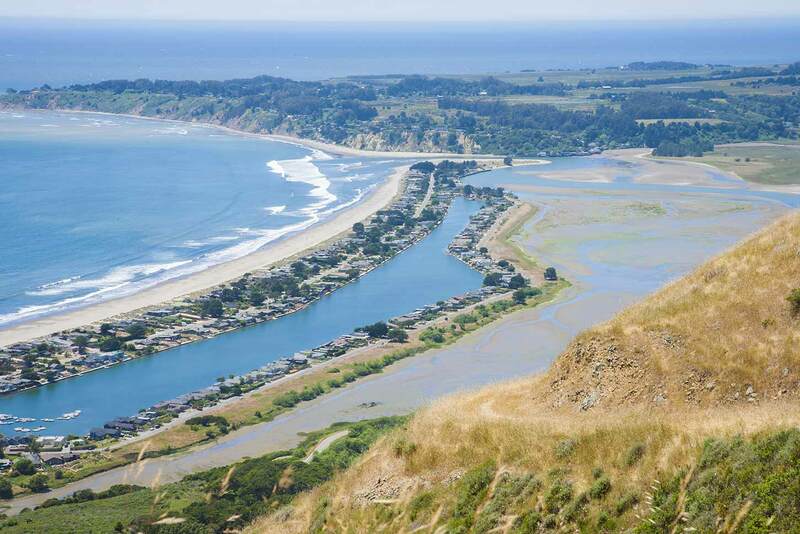 This extremely popular trail climbs through woods before breaking out into chaparral and continuing to climb, offering some great views of Stinson Beach, the ocean, and the pretty redwood-covered bluffs that tower over the town. The climb through Steep Ravine is another highlight of the hike. 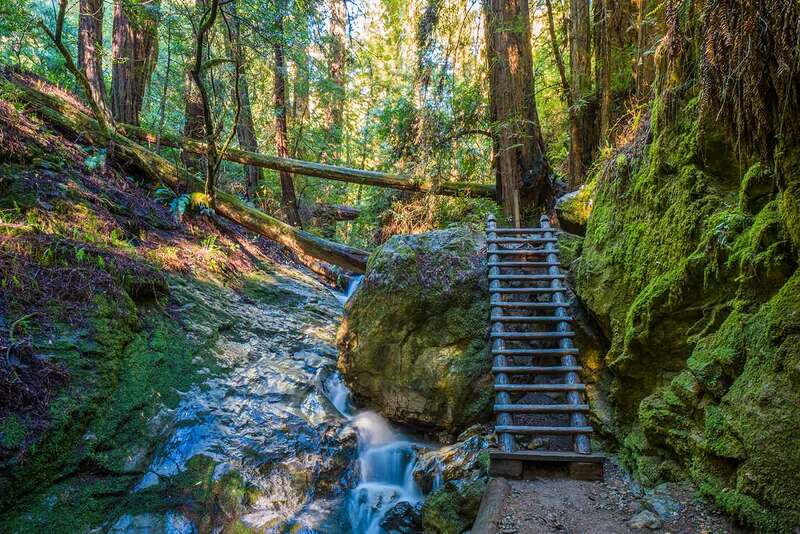 Within the ravine, the trail climbs steeply through attractive groves of small to mid-sized old-growth redwoods via an engaging series of steps and bridges. The area is lushly overgrown with ferns and a little brook cascades down the ravine. On a hot summer day, the cool, shady woods are a refreshing contrast to the baking-hot chaparral and grasslands. 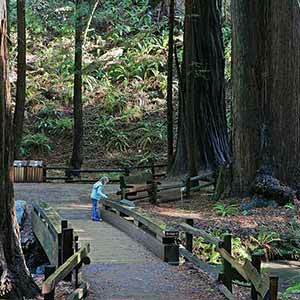 Near the top, the redwoods end and the forest takes on a drier appearance. The trail finally emerges from the woods at the Pantoll parking lot.